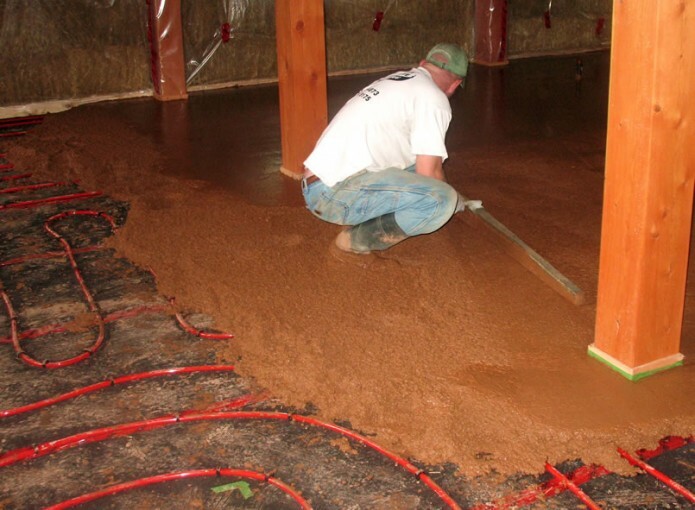 Radiant hydronic floor heat is a heating system that runs hot water through tubing that is embedded in an earthen floor or a poured concrete floor. The heat from a hydronic floor radiates up into the furniture and the feet of the occupants, so the room feels comfortable even at lower operating temperatures. This photo shows a coloured concrete floor being poured. In the book “Prescriptions For A Healthy House”, Paula Baker-Laporte, Erica Elliott, and John Banta recommend not using copper tubing, as was previously common, because it can conduct electromagnetic fields through the structure if it becomes charged anywhere along its route. Instead they list two types of odorless polyethylene tubing for use with hydronic floor heating systems. And combining hydronic heat with passive solar orientation makes the heating system for a house even more efficient, as the thermal mass in the earthen floor or concrete floor holds and re-radiates the heat over a longer period of time.